The most popular of all the anemones. De Caen Mix won its fame for the quantity, color, and size of its poppy-like flowers. Plants produce up to 25 blooms each over a bloom period that lasts up to 8 weeks. 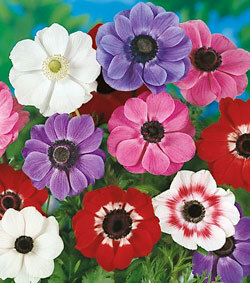 They light up the late-spring garden in a festive mix of red, pink, purple, blue, and white. Their oriental charm and vivid colors make them a focal point in the garden and in bouquets. Grow in planters for decorative touches on patio or porch. 8-10 inches tall.